A list of reports is available in different categories. 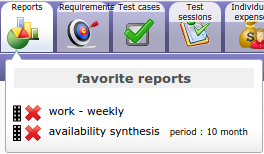 Select a category , corresponding reports list will appear. Select a report in the list, this will display specific parameters for the report. Update the parameters to get the information you need. Click on a button to produce the report. Click on the arrow to return to the category list. Click on to display the report. Click on to get a printable version of the report. Click on to export the report as PDF format. Click on to display this report on the Today screen. Click on to define this report as favorite. This report will be available in your favorite reports list. Move your cursor over the reports menu icon (in the top bar) to show the popup menu that contains your favorite reports. Allows to reorder reports displayed with drag & drop feature. Using the selector area button icon drag . Click on to remove the report from the list. Select a report to display (in print mode), without leaving the current screen.